Proline Hockey Odds: You know they're bad,but just how bad are they? 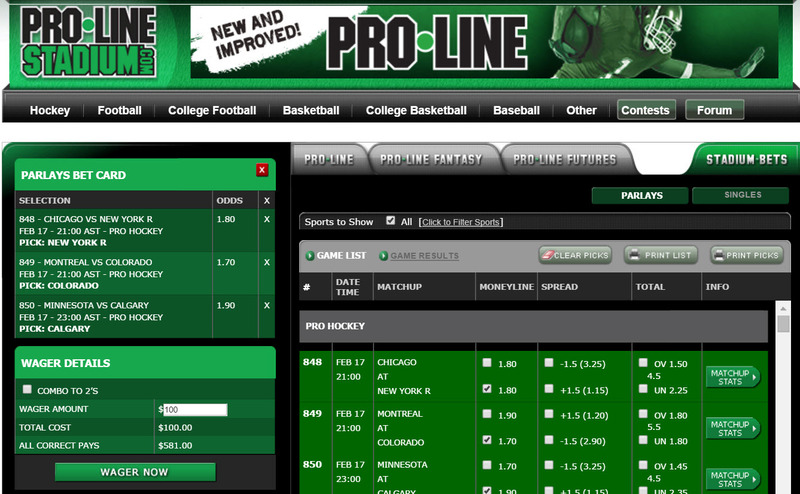 How Bad Are Proline Hockey Odds, Really? We Canadians all know that Proline hockey odds aren’t very good. Same goes with betting hockey on Sport Select or Mise-O-Jeu or Proline Stadium, or even PlayNow in B.C. But just how bad are Proline hockey odds, especially when compared with what’s available across the rest of Canada or what you can find at online sportsbooks? That’s the question we’re going to answer in this article. 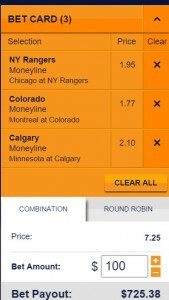 Why Do People Bet Proline Hockey Odds? The point of this article isn’t to ridicule anyone who likes to bet hockey on Proline, the Ontario sports lottery. Instead, we’re looking to educate. After all, both of us are from Ontario, and our first introduction to NHL betting was by playing Proline. We played it because we didn’t really have any other options, and we were happy to take what we could get. They’re run by our provincial governments and proceeds go to charity. You don’t need to deposit money using a credit card or other deposit method. When you win, you can get paid cash the next day by redeeming your ticket at your local convenience store (up to a certain amount). There used to be another advantage of betting Proline hockey as well: capitalizing on outdated odds. Twenty years ago, the Proline hockey odds were printed weekly and they never changed. If there was an injury to a star player, a trade or something else that caused the Vegas lines to move, you could sometimes get better odds on Proline than anywhere else. However, Proline now updates its hockey odds on a daily basis, and some of the other provincial sports betting lotteries even update their odds throughout the day. And although buying Proline tickets at a local gas station or grocery store used to be considered really convenient, it’s nowhere near as convenient as placing bets online via your desktop, tablet or smart phone. But when you see how Proline hockey odds compare to what’s available in other provinces, let alone what you can get at online sportsbooks, we’re sure it’s going to be the last straw for anyone still betting hockey with the OLG. To illustrate exactly how the different provincial sports lotteries stack up when it comes to hockey betting odds, we put together a 3-game NHL parlay at each of the provincial lottery sites to see what each of them paid. And even though we were already skeptical of Proline hockey odds going into our experiment, we were still stunned by what we saw. Here’s our comparison of the various provincial sports lotteries in Canada, starting on the west coast and working our way east. 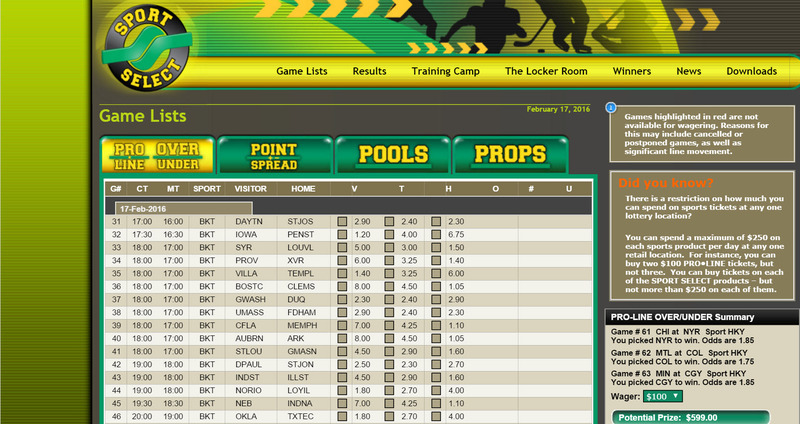 By provincial sports lottery standards, PlayNow NHL odds are actually pretty good. 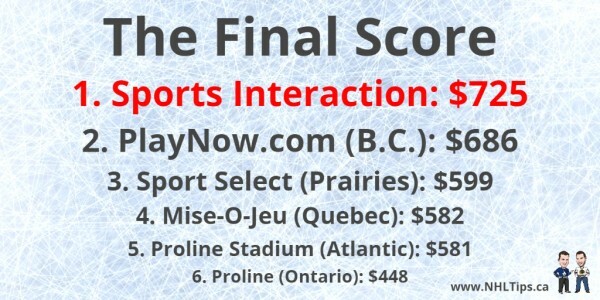 When we compared a 3-game NHL parlay payout between the provincial sports lotteries and Sports Interaction sportsbook, British Columbia was the best that the lotteries had to offer. 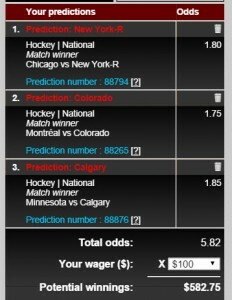 As you can see here, a $100 PlayNow NHL parlay on the Avalanche, Flames and Rangers (far left) paid $686.48. That was only $40 less than Sports Interaction (near left), which paid $725.38 on the same bet. Not only are PlayNow NHL odds the best of provincial sports lotteries, they also offer the greatest selection of NHL props and even live betting. Unfortunately, they still require you to place parlay bets. Until sports betting in Canada includes government-regulated single game betting, Sports Interaction and other online sportsbooks are the only place to bet one game at a time. Things take a pretty big drop when you start heading east. The Sport Select NHL odds are significantly worse than PlayNow. 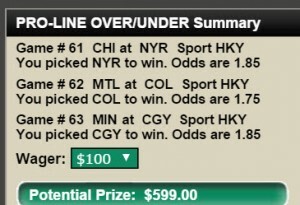 On that same 3-game NHL parlay, Sport Select paid $599, which is 13% less than what British Columbia PlayNow paid. Compared to Sports Interaction, Sport Select NHL odds on a 3-game NHL parlay were 17.5% worse! Sport Select NHL odds are also very limited, offering just moneyline, Over/Under, point spread, pools (most games right splits the pot) and a small props menu. Like we said earlier, if you live in Ontario, you might want to close your eyes. Proline hockey odds are by far the worst of all provincial sports lotteries. The payout on this 3-game parlay was $448, not even 65% of the payout at British Columbia PlayNow! When compared to Sports Interaction, Proline odds paid nearly $300 less on a 3-game ticket. We actually took the Avalanche off this parlay at Sports Interaction and a 2-game parlay there still paid almost as much as this 3-game parlay at Proline. If you live in eastern Ontario, you’re probably tempted to make the drive to Quebec to buy a Mise-O-Jeu ticket. Mise-O-Jeu hockey odds are much better than Proline NHL odds, though they’re still quite a ways down from PlayNow. 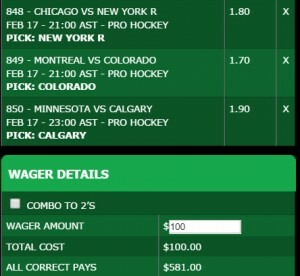 Mise-O-Jeu paid $582.75 on this 3-game parlay, a little over $100 less than PlayNow NHL odds. Sports Interaction’s payout on this bet was 20% higher than Mise-O-Jeu. 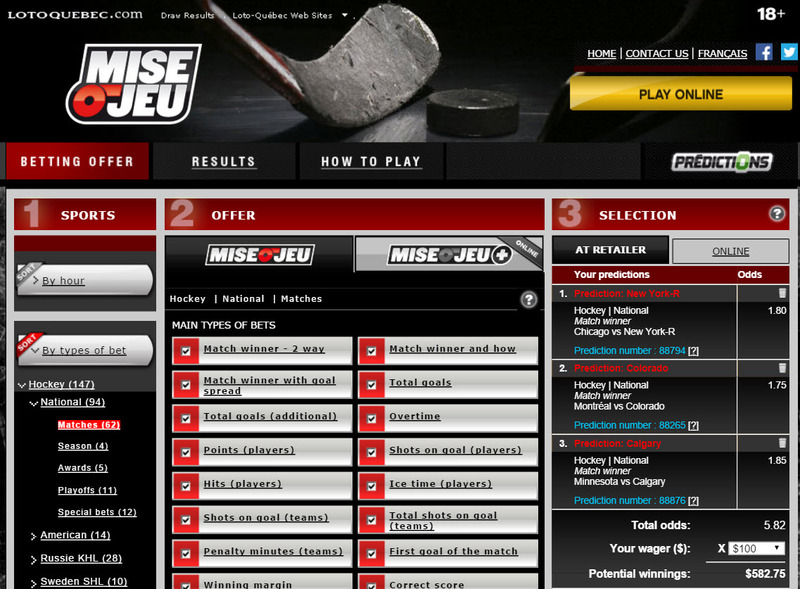 We do like how you can bet on more than just NHL games at Mise-O-Jeu. They also offer Stanley Cup betting odds, lines on who will win major awards, and even fun props like whether players will get traded or coaches will get fired. The Proline Stadium hockey odds are essentially the same as Mise-O-Jeu. 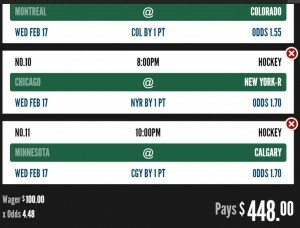 On this 3-game parlay, Proline Stadium paid $1.75 less than the Quebec sports lottery. They’re still $100 less than PlayNow, and 20% less than Sports Interaction sportsbook. It’s too bad the Proline Stadium NHL odds are this low, because they actually have a pretty good website for NHL betting. There are previews, consensus reports, news articles, a discussion forum and more. There is a huge disparity between the provincial sports lotteries when it comes to NHL odds. Why is it that Proline hockey odds are so bad that Ontario residents should only win two-thirds of what British Columbia residents can win on the same bet? If only we could all bet at PlayNow! Unfortunately, however, Canadians can only buy provincial sports lottery tickets in the province that they’re physically in, or online from the province that they reside in. It leaves you at the mercy of the lottery corporation that operates in your province, which is bad news for people who live in Ontario (which just happens to be the heaviest-populated province in the country). Unless, of course, you play at online sportsbooks like Sports Interaction. You can bet with them regardless of where you live in Canada, and you’ll get the best odds on all your NHL bets. Plus, you can get a signup bonus, better selection of props, live betting and, the biggest perk of all, the ability to bet one game at a time. Let’s face it. Getting paid cash in hand for a winning Proline ticket can’t be worth all that extra money you’re leaving on the table. 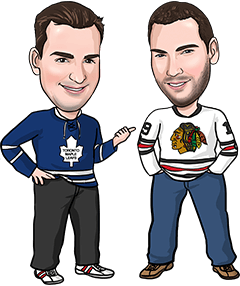 You owe it to yourself to at least check out the hockey betting sites we recommend for Canadians and start getting paid what you actually deserve for picking winners.